Oh hey, it’s me. And apparently I’m the only blogger around who hasn’t made an extensive list of EVERYTHING you need to make for Thanksgiving. Perhaps it’s because I’ve never been that into the traditional Thanksgiving meal up until a few years ago; before that my Thanksgiving consisted of Mom’s stacked enchiladas, posole, spanish rice and empanadas. The only thing traditional we had was pumpkin pie (because I requested it of course). And who could get sick of those kind of leftovers? Not me. However, I will admit that I really do enjoy turkey, cranberries and all things sweet potato during this holiday. There’s something so completely comforting about all of it. 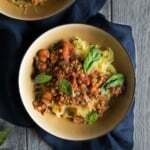 I’ve created some of my own favorites over the years that would be terrific for your main meal celebration: lightened up sweet potato casserole (so fabulous), maple-bacon roasted brussels sprouts (DAMN), kale quinoa edamame salad (reader favorite), maple butternut squash and apple soup (creamy, gluten free and vegan-friendly), honey pumpkin cornbread muffins (healthified), cranberry orange pecan quinoa salad and even how to make the perfect cheese platter (you fancy)! But if you’re much more into desserts, you know I’ve got those covered. My favorite include the best apple crisp ever (seriously there’s brown butter in it), upside down salted caramel apple cake, melt-in your-mouth brown butter pumpkin coffee cake (ridiculously delicious), dulce de leche pumpkin mousse pie (serve it frozen if you’d like), gluten free sweet potato pie with pecan crust, brown butter snickerdoodles (serve ’em with ice cream), chocolate cheesecake with nutella ganache (prize winning!) or those famous nutella-stuffed brown butter chocolate chip cookies (HELL YES). 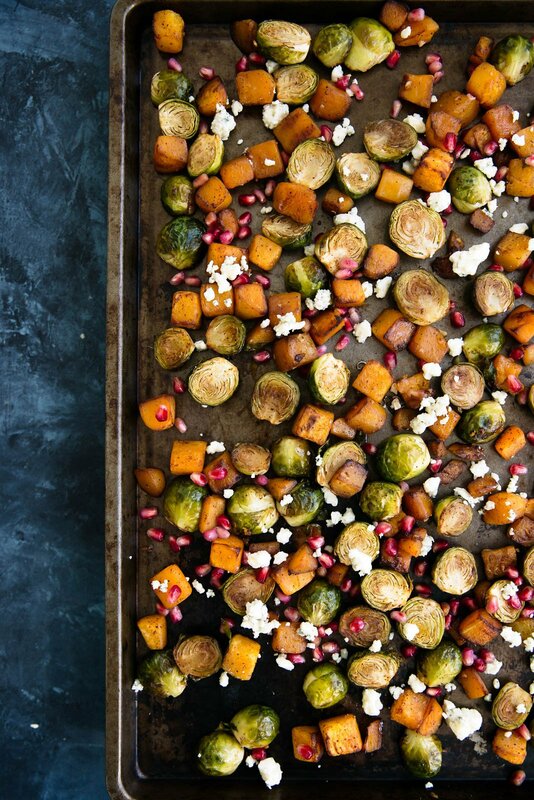 Oh and now, this super delicious and oh-so-easy roasted squash and sprouts veggie side. Could be my side dish favorite. For reals. 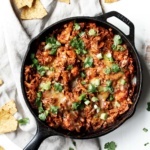 Best yet, this recipe is super easy to put together. The squash and sprouts are tossed in a sensational garlic-chili-maple sauce then roasted to perfection. 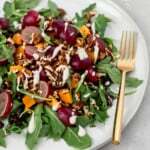 The tangy Gorgonzola and sweet pomegranate pair wonderfully and help keep this salad balanced with unique flavors. I thought about adding pecans but forgot to grab them at Trader Joe’s so I left them as optional in the recipe; I think toasted walnuts would be delicious too! Last night, I had the leftovers in my fridge and decided to saute it with some cranberry turkey sausage I picked up from TJs. UM, delicious! I would also recommend this with an egg on top. Happy cooking and baking these next few days. Tag your creations #ambitiouskitchen on Instagram so I can see what you’re making! To keep up to date with posts and behind the scenes info on Ambitious Kitchen, follow me on BlogLovin’, Facebook, Twitter, Instagram and Pinterest. xo! 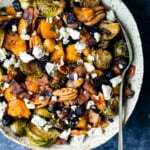 Delicious brussels sprouts and butternut squash tossed irresistible chili-maple sauce then roasted to perfection. 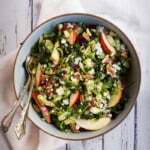 Topped with sweet pomegranate seeds, zesty gorgonzola and crunchy pecans or walnuts if you'd like. 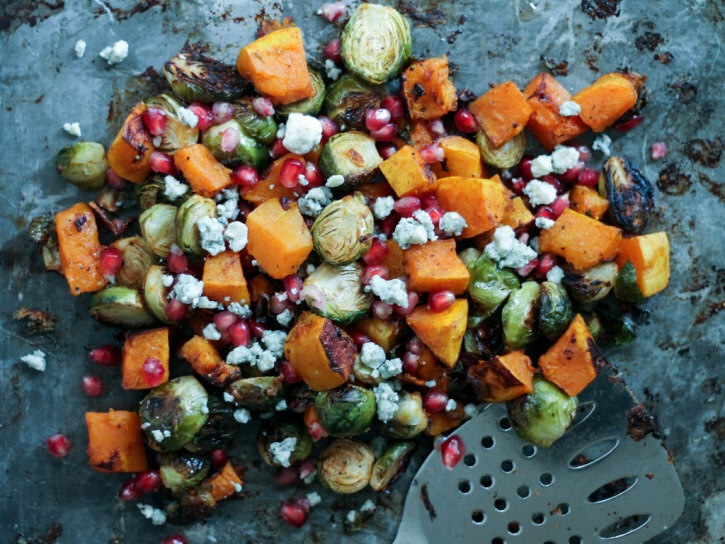 Preheat oven to 400 degrees F. Add butternut squash and brussels sprouts to a large bowl. 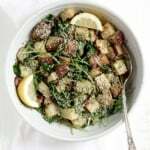 In a small bowl, whisk together olive oil, maple syrup, garlic, chili powder and cinnamon. Pour over squash and sprouts and toss to evenly distribute. Pour on a baking sheet and spread out evenly. 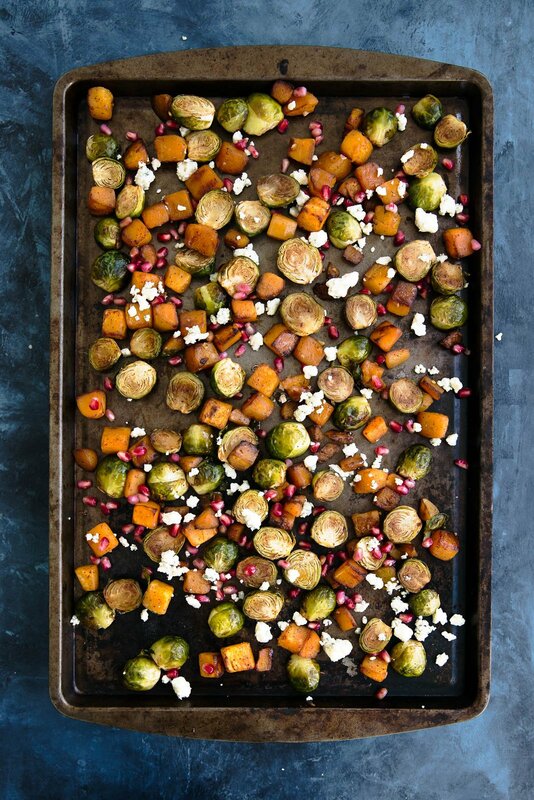 Roast in oven for 25-30 minutes or until squash is fork tender and sprouts are slightly crispy and caramelized. Remove from oven, cool for a few minutes then immediately transfer to a large bowl. Top with pomegranate seeds, gorgonzola crumbles and pecans, if desired. Serve immediately. I recommend doubling for a crowd! 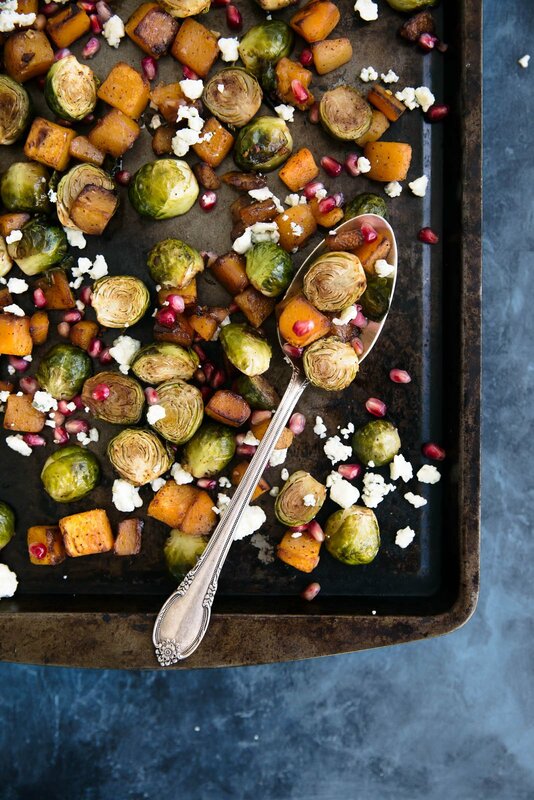 16 Responses to "Garlic Chili-Maple Roasted Butternut Squash & Brussels Sprouts with Pomegranate + Gorgonzola"
Same here. 😉 And I’m not baking cookies yet either..lol. But if you need an easy healthy dinner? I’m your girl. I would eat this anyyyytime!! Alex and I are in charge of brussels sprouts, among other things, this year. We have a whole thing planned, but I think it’s going to change after seeing this recipe. I think it’s the gorgonzola. Or the squash. Or the roasted brussels. Maybe all of it? I am drooling over the chili-maple-gorgonzola combo!!! YUM! I actually just bought some pecans and brussel sprouts (I had been craving them for ages!) and I have a sweet potato in my pantry which shall sit in for the squash. This is definitely happening!! This was seriously amazing. Made this yesterday to have for lunch in Minnewaska State Park, NY. Will be making this again and again! Thanks for the recipe! Wow, Monique, this is an awesome recipe! 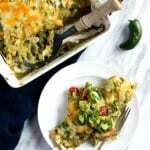 I made this to go with my husband’s chicken dish and it was a hit. Delicious, beautiful & easy…what more can you ask for! Looks yummy! Question though – could you use fresh cranberries instead of pomegranates if you roast them with the vegetables? Do you buy cubed squash, I only like butternut/cup squash and wondering how difficult it is to cube?